Often I start cooking with one ingredient that I want to use in mind and then back into a recipe from there. This is one of those times. I live near Plymouth, Massachusetts, and recently I learned that I’m descended from John Jenney, who managed the first mill built in the Plymouth Colony. It’s still there—in spirit, at least—and now belongs to Plimoth Plantation. The site of that first mill is known, although once it shared space along the small river that runs through the town with a lot of other mills of varying kinds—but the original mill itself burned down in the 19th century and was rebuilt then. The millstones (there are only the two, top and bottom) in the newly-rebuilt mill came from Pennsylvania. Anyway, I decided to pay tribute to the memory of great-great…grandfather John and visited recently, and learned how corn was ground in 16-whatever and for a long while after that. 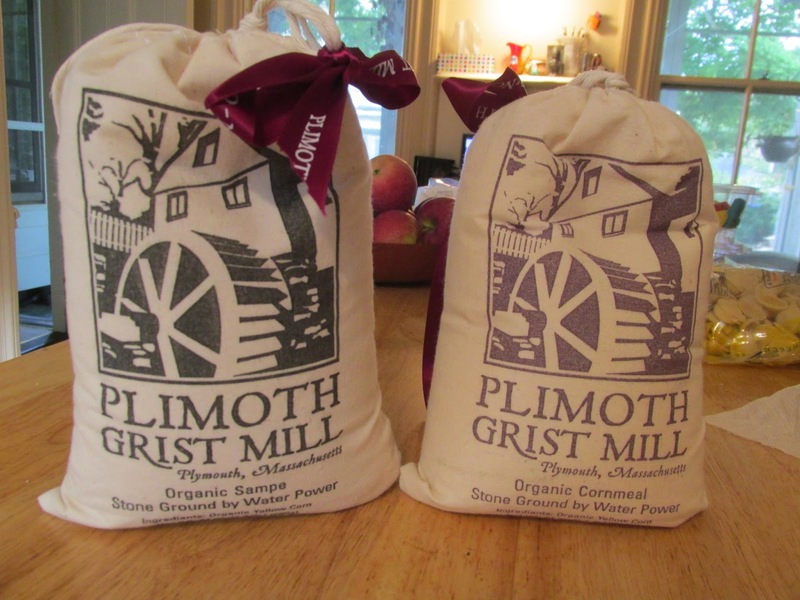 It’s a process that still works, so of course I came home with some ground corn, both coarse and fine. Now, what to do with it? 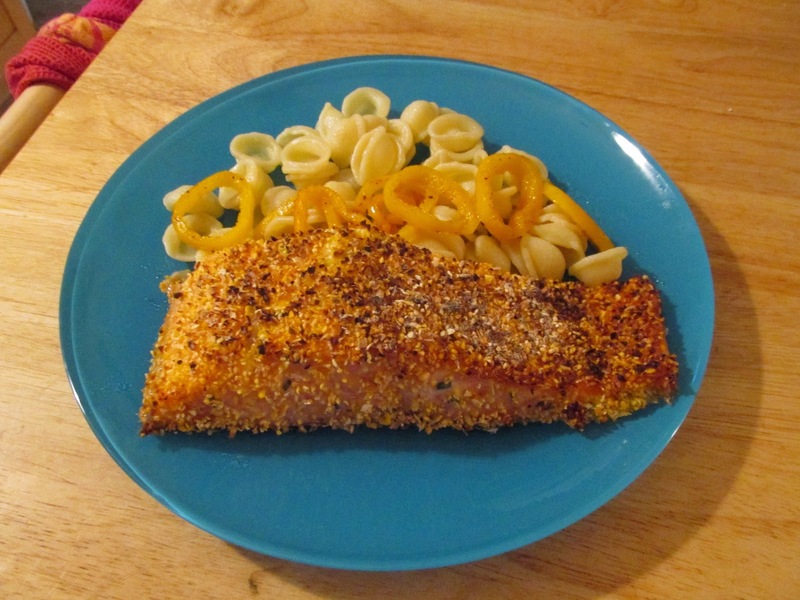 Cornmeal is a little sweet, and so is salmon, so I decided to put them together. 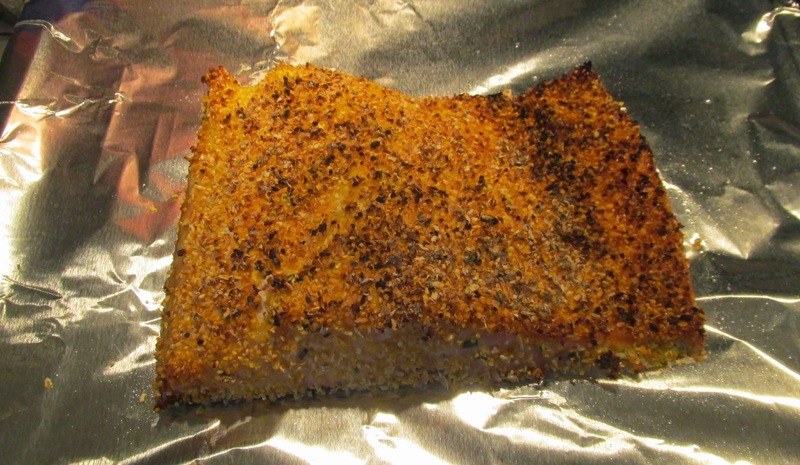 Cornmeal also adds a nice crunch to the fish, but you’ve got to make it stick. So I came up with a recipe for a yogurt sauce. 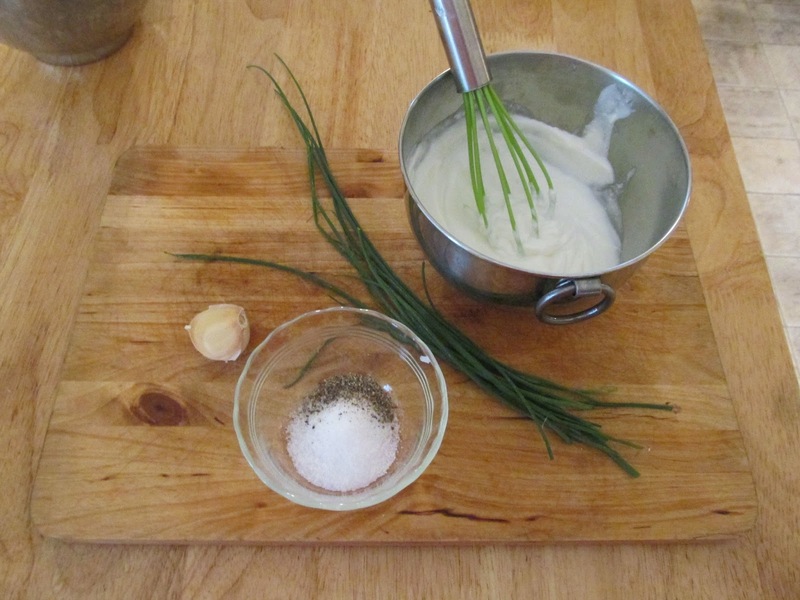 Most sauces using yogurt seem to come from Middle Eastern recipes, with herbs such as mint or coriander, but that didn’t seem to work with the colonial theme, so I tinkered with the recipe to emphasize the savory rather than the sweet. Here’s the result. Mix the yogurt, olive oil, garlic and spices together. 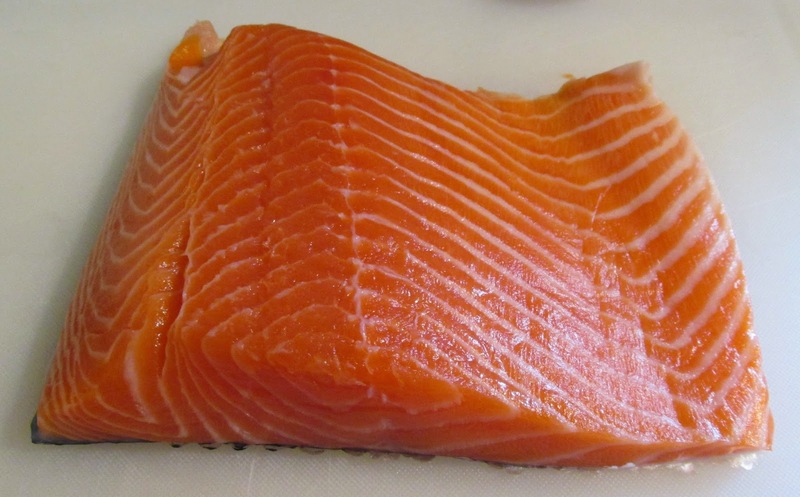 Coat the salmon with the mixture, then press the cornmeal onto the surface to form a thin crust. Save the sauce you have left over to add after cooking. Cover a broiler pan with foil and place the coated salmon piece on it (you could also do this on an outdoor grill, but watch that it doesn’t overcook). Set the oven rack in the middle of the oven, not too close to the broiler flame—you need to make sure the fish is cooked through before the crust is too brown. Broil for 5-10 minutes (sorry to be vague, but this time depends on how hot your broiler is, and how thick your salmon filet is), or until the fish feels springy rather than squishy. Serve immediately, topped with some of the remaining yogurt sauce, accompanied by a vegetable—in this case I had some lovely little peppers so I sliced those and sauteed them quickly in olive oil while the fish was broiling. 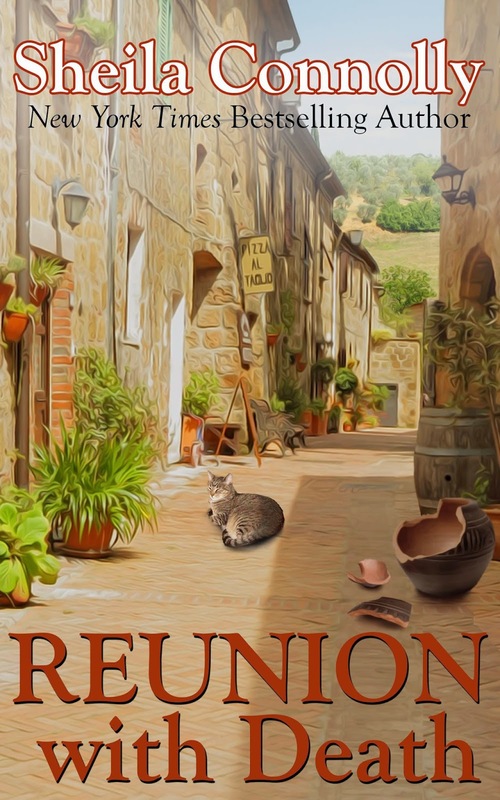 Laura Shumway couldn’t say why she’d agreed to go on the class reunion trip to Italy. Maybe it was to take stock of her life, or maybe it was just to catch up with old friends, take in the sights, and relax in the beautiful Tuscan countryside. Either way, she knew she’d discover a lot on the trip, both about herself and her former classmates. What she didn’t expect to discover was the dead body of esteemed professor Anthony Gilbert. Before the polizia or carabiniere get involved, Laura and a few trusted classmates set out among the vineyards and hills of the Italian Riviera to solve the murder on their own. With the help of some influential locals and good old-fashioned detective work, they're soon led to the conclusion that one of their classmates might be a killer—and what started as a trip to see how far they’d all come may turn into a stark lesson about just how far one of them would go. Available for Kindle and Nook, and most other e-formats. 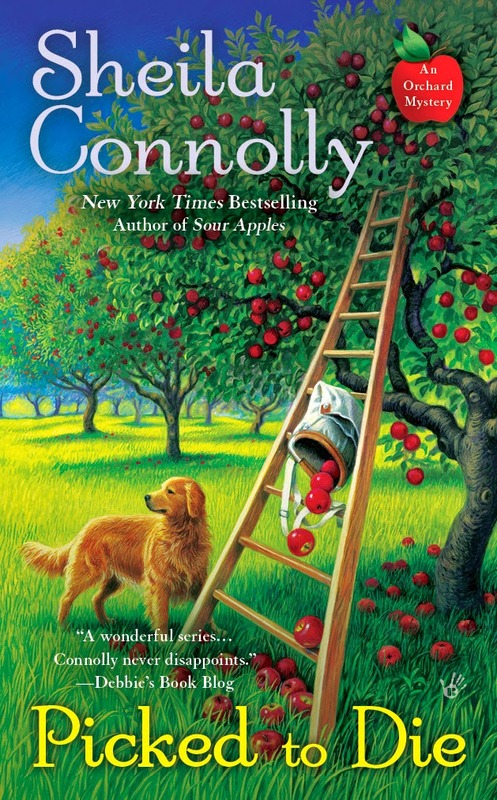 And in case I haven't reminded you enough, Picked to Die (Orchard Mystery #8) comes out next Tuesday! Sounds great, Sheila. One of the characters at the 1870 live-in I attended last week talked about eating "samp" for breakfast and dinner at the town farm - public housing for the indigent. Otherwise known as corn meal mush! If you need some, I know where to find it! I was also told by one of the docents that they're trying to find a good source for what we know as Indian corn (with the multi-color kernels). She said it makes a nice pale lavender corn meal. I know what you what you mean about backing a recipe. Isn't it fun when it turns out great? This looks lovely. The blue plate is a great choice for showing off the colors. Sheila, the fish looks great. What a good pairing! Good luck with your release next week! Love "springy rather than squishy!" I so rarely use the broiler. You're inspiring me to try it with fish.